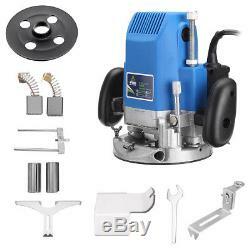 Package Included: 1 x Electric Trimmer Wood Tool 1 x Circular Milling 1 x Dustproof Plate 1 x Template 2 x Carbon Brushes 2Pcs Straight Guide 2Pcs Collets(6mm, 8mm) Specification: Plug: US (sent with an adapter according to your country) Input Power: 1800W Rated Voltage: 220V Frequency: 50/ 60HZ No Load Speed: 23000RPM Collets Supplied: 1/4, 6mm and 8mm Dimension: Approx. 26x16x23cm/ 10.24x6.3x9.06 Cable Length: Approx. 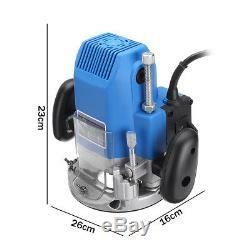 180cm/ 70.87 Depth limit screw, accurate control. The base can be lifted and adjusted. Height locked rod, accurately fixing the processing depth. Widely used in wood processing, furniture manufacturing and other industries. Apply to wood, plastic sheeting, wood veneer and other similar materials chamfering, grooving, surface finishing, curve cutting, planing wood edge, pattern processing operations activities. International buyers please note: a. 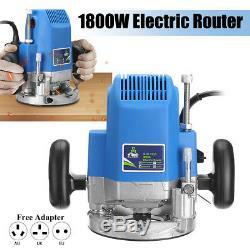 The item "1800W 1/4 3/8 1/2 Collet Electric Hand Trimmer Wood Router Joiners Tool 220V" is in sale since Wednesday, April 11, 2018. 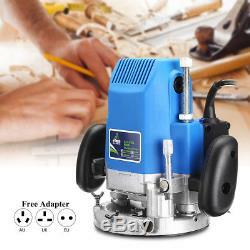 This item is in the category "Home & Garden\Tools\Power Tools\Routers". The seller is "cskwin2015" and is located in HK. This item can be shipped worldwide.